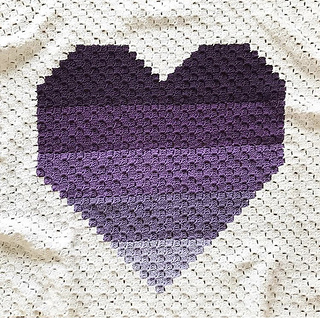 A free pattern to construct a corner to corner blanket with a large ombre love heart in the centre. 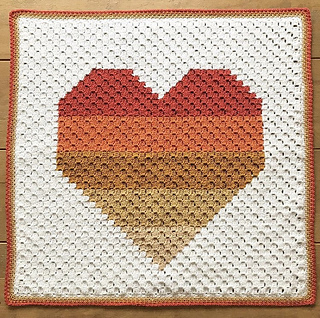 The blanket can be made using any type of yarn; the examples use DK weight yarn, and yarns of greater or lesser weight will give larger or smaller results. The pattern is very simple using only treble crochet stitches. If you are new to the corner to corner crochet technique there is a step by step guide showing you how to do this. If you have used corner to corner before there is an abbreviated pattern and a chart for you to use. Using DK yarn you will need roughly 200g of the main background colour, 10g of the bottom colour, 30g each of the three middle colours and 40g of the top colour. The blanket is a great stash buster as the amounts of colours needed are so small. If you have any queries please feel free to contact me via Instagram @emmacartercrochet or email emmacartercrochet@outlook.com.